Oachira Kali is a unique ritual held at the famous Oachira Parabrahman Temple in Kerala. This temple is also known as the Dakshina Kashi (Kashi of South). Oachira Kali 2019 date is June 15 and June 16. Oachira Kali is a mock battle between two groups through the marital art of Kalaripayattu – they recreate the battles fought more than 300 years ago on the paddy fields of Oachira by the then Kayamkulam King and Venad King. The ritual involves display of Kalaripayattu – the martial art of Kerala. Different groups representing different villages show their expertise in the marital art on the two fields set up for Oachira Kali. The warriors that participate in the ritual undergo a 41-day vrat. Before the start of the Oachira Kali, the presiding deity in the temple, Lord Shiva is taken out in a procession on the Vrishabha Vahana. The warriors that are participating in the ritual follow the procession. The procession ends on the field where the mock fight and the display of Kalaripayattu take place. The mock fight between different groups start after witnessing the Sri Krishna parunthu or eagle flying atop the field. In the evening, the warriors pledge to return next day and take leave for the day. 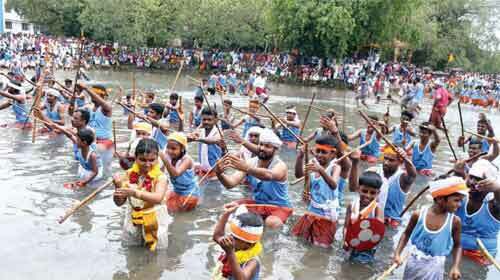 On the second day afternoon there is again display of the various movements in Kalaripayattu. At the end of the day, prizes are distributed to the best warriors. Oachira Temple is a unique temple in South India, as there are no major temple structures. The deities are worshipped under banyan trees.